or soon we will have to learn to live without them. Only 23,000 remain, a 75% decline in just 20 years." 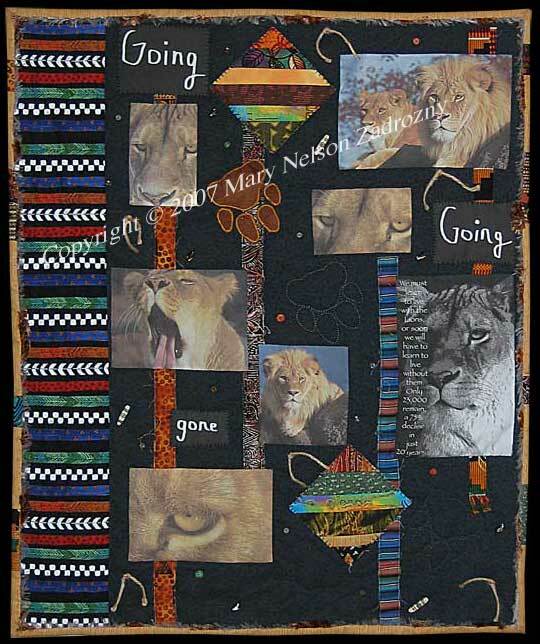 Title: "Going, Going, Gone - Where Did All The Lions Go?" Quilt Description: The inspiration for this quilt started with the beautiful images by photographer Gene Seliger (permission granted). The full paw print in the upper part of the quilt is made from brown suede. As the prints track down the quilt, they slowly fade to the barely visiable outline of a paw, representing the disappearing lion population. This quilt took 43 hours to complete. Materials: Cotton fabric, brown suede recycled from old purse, eco-friendly 100% PLA fiber batting from Eco-Craft. Embellished with beads, twine, fringe yarn. Techniques: Fusible Applique, Raw-Edge Applique, Needle Turn Applique, Photo Transfer, Hand-Quilted.